In my quest to learn how to smoke meats, I have finally tried my hand at smoking a brisket. But today’s post is not about actually smoking the brisket, it’s about the prep work. I needed to find a good brisket dry rub recipe to get my brisket ready for the smoker. As I’ve mentioned many times on this site, I’ve purchased a Char Broil Big Easy Smoker and have been trying my best to add smoking meats and other BBQing methods to my cooking skills. 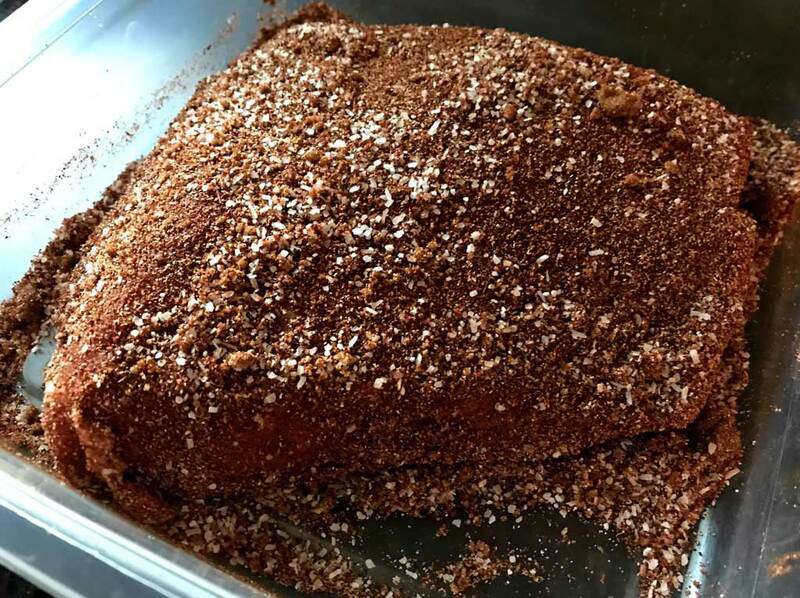 And when I was finally ready to try smoking a brisket, I knew then I needed a good brisket dry rub recipe. The one thing I learned this year about marinades and rubs is that white meat should be brined and red meats should be rubbed. I’m sure there are exceptions to this rule but for now that’s how I cooking my meats. Chicken, turkey and pork get the brine and the red meats get the dry rub. I think it’s because you don’t need to add additional liquid or moisture to these meats and so they come out better with a dry rub. This rule has served my well so far. 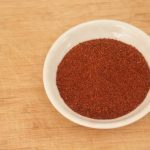 Now you can easily buy a dry rub in a bottle at the supermarket or at a BBQ speciality store but the key to a great dry rub is the freshness of the spices. I wouldn’t buy a bottle of dry rub that has dust on it. And you’ll definitely find some dusty old bottles in some stores. But since I already have all of the spices in my pantry, I might as well create my own brisket dry rub recipe. Should you use mustard before the dry rub? This is a question that I see people asking all the time. If the meat is on the dry side and you want to make sure that the dry rub sticks to the surface and adds flavor, then yes, feel free to slather mustard all over the meat before adding the dry rub. The mustard will cook off and won’t really add flavor to the meat. So think of it as a flavor delivery enhancer. With the flavor coming from the rub. Another question that I see people asking a lot is how long to let the dry rub do it’s thing? I find that I’m ask myself this question too often because I don’t plan ahead. When I’m firing up the smoker on Sundays, I should have had the meat in the fridge with the dry rub on it the day before. But unfortunately, that’s not always the case. A lot of times, I’ll run out to the buy the meat Sunday morning and I only get a few hours with the dry rub. Definitely not the best way to do this but this is how busy BBQ Dads have to roll sometimes. I’m sure there’s a perfect world out there where my kids didn’t need to be driven to their activities or their friends houses or someone from my 9-5 wasn’t emailing me with urgent tasks. In this perfect world, I have time to sit down and plan ahead. My dry rubs would be applied for at least 24 hours before cooking. And everything would be fine. But back here in the real world, did a few hours help flavor the meat? Yes, definitely. Not as much as it had a chance to sit for 24 hours but it helped. If you can, go for 24 hours. So how did the brisket come out? Was the brisket dry rub recipe any good? The short answer is yes it came out great. The dry rub was awesome and the brisket was delicious. I’ll go into more detail on smoking a brisket in another post but for now, I feel like I’ve found a great brisket dry rub recipe.